EVGA has been working hard to capitalise on the momentum it built up during the early days of Nvidia’s nForce 680i SLI launch and during the show it showed us a special-edition nForce 780i SLI motherboard it’s working on. It’s known as the nForce 780i SLI cheesecake FTW edition and features a whole host of improvements over the standard ‘designed by Nvidia’ board. EVGA has recently acquired around 30 motherboard engineers and it says that it is planning to develop some of its own original designs moving fowards. We’re told that most of the engineers came from EpoX, which has now all but pulled out of the enthusiast’s motherboard market. The board design we saw was a non-working sample that isn’t finalised, but it does give us an idea of where EVGA is heading with its 780i SLI cheesecake edition. 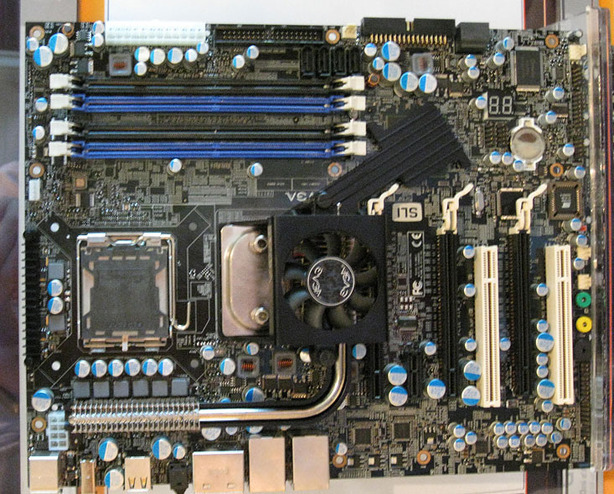 It uses pretty much the same basic layout as the standard nForce 780i SLI board, but EVGA has swapped out the standard capacitors for 100 percent solid state aluminium ones and has improved power regulation around the CPU socket by replacing the default six phase solution with an eight phase design. In addition, the company has implemented a hybrid cooling solution that, again, isn’t quite finalised but it gives you an idea of what EVGA is looking to do. While it’s not quite as extreme as the cooling solution that Foxconn has implemented on its BlackOps board, it will cater for both air and watercooled configurations. The current design has a few flaws that EVGA is aware of and will fix before the product launches in the next few months. These include the fact that the barbs aren’t user interchangeable and the fan will get in the way of any graphics card that has a plate on the rear (like EVGA’s ACS³-branded products). Finally, EVGA also says that it will be implementing a further two SATA 3Gbps ports—in addition to the six supported by the MCP—onto the board via a third party chip, but the company didn’t detail which controller it would use and whether or not one of the additional ports would be eSATA. We’ll bring you more information as the board’s progress gets closer to volume production – for now, we’ll leave you with a picture of this piece of cheesecake which, of course, you are free to discuss in the forums. The political wrangling continue this morning as EVGA confirms its position to bit-tech: "We're Nvidia only"
UPDATED: We were told by AMD themselves that EVGA wanted to sell ATI cards, however EVGA contacted us with a statement claiming it to be the other way around.